Gangplank Slipholders Association (GPSA): Missed This Year's Parade of Lights? Relive It Now! Missed This Year's Parade of Lights? Relive It Now! There was palpable excitement in the air on Saturday afternoon as Gangplank Marina slip holders put the final touches on their boats for the Annual Holiday Boat Parade of Lights. Power tools buzzed and whirred and hammers slammed as each display was perfected. Around 3:45PM, one boater’s loudspeaker crackled to life with “The Grinch Who Stole Christmas.” He turned on his lights, cast off his lines, and headed out to the staging area at the front of the Washington Channel. Other parade participants soon followed suit. The Parade of Lights is a joint effort of the District and the City of Alexandria. It begins in the Washington Channel at 5:00PM and reaches the Alexandria Harbor by 6:00PM. Local boaters enter to compete for prizes from “Best in Show” to “Best Try, Most Spirited Crew”. It is a favorite holiday event of Southwest residents, including the live-aboard boaters at Gangplank Marina. This year, Gangplank had six boats participate in the parade, more than any other marina or boat club. By 4:00PM, the seawall along the Southwest Waterfront was brimming with excitement. 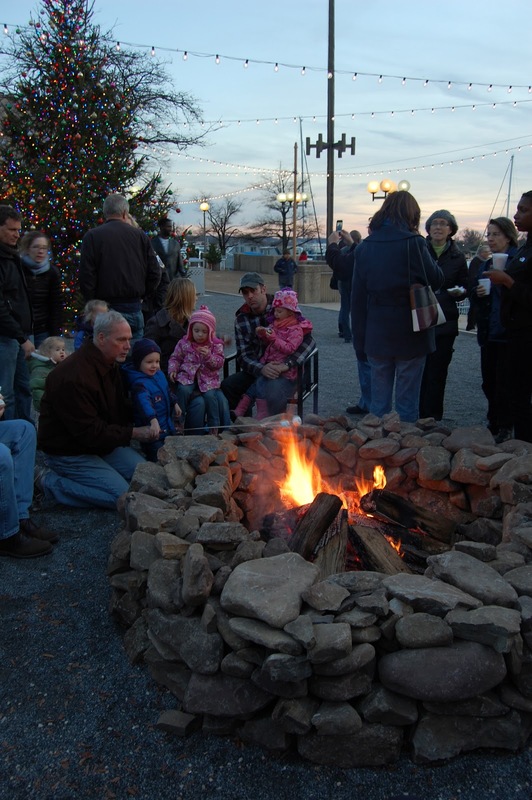 Over 100 people had gathered for the Southwest Tree Lighting at 7th Street Landing. The Washington Waterfront Association and Hoffman Madison Waterfront sponsored a beautifully decorated tree, free photos with Santa, live reggae music, hot cocoa, and a bonfire for making S ‘mores. The event was family friendly and everyone present was clearly enjoying the jolly mood! Organizers snapped a photo with Tommy and Santa shortly before 5:00PM. Then, everyone turned their eyes towards the water. If you haven’t seen the Parade of Lights before, I’d describe it as one of the most unique, creative and festive holiday celebrations you’ll find anywhere in the District: boaters use ingenuity, imagination, and holiday light displays to create incredible floating art. Right at 5:00PM, the John Glenn Jr. began to pass down the channel with a beautiful display of green and red lights reflecting in the calm water. She was followed by another 45 boats with stunning displays, including a fire breather, a sea turtle, and a Santa merman. Cameras clicked in rapid-fire succession alongside the crackling of the bonfire as those gathered at 7th Street Landing tried to capture every moment of the festive atmosphere. Once the parade concluded, many people stayed to enjoy the mild weather, beautiful fire pit and warm company of their neighbors.